I have been wearing my hair a little longer recently (it looks weird in hats otherwise!) and am able to do a little more styling-wise, like curling it with my GHDs. The best part is that the wave holds, even in the wind and rain! I have had my Fitbit for nearly 2 months now and and I really love it, it has definitely inspired me to move more. It is so nice to spend time with family and although I don't get to see them as much as I would like, they are pretty darned special. Now can you guess which of us are related?! 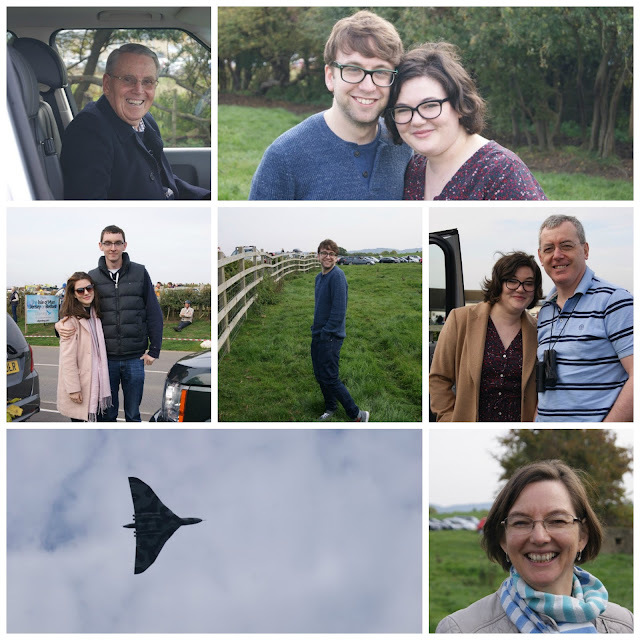 My Grandad, me and Mark, my sister Catriona and her boyfriend Rory, Mark doing his best fashion blogger pose, me and my Dad, the Vulcan swooping overhead and my Mum. Haha, love this post=D That is a very pretty dress and suits you perfectly. Gorgeous curls going on there too. Well done with the progress with your FitBit, I have to agree they really get you moving. It was good tracking my stats in preparation for my walk. It has sadly been neglected ever since but i'll start moving again in the New Year. Which one do you have? I've been forever debating a fitbit - maybe It's time I took the plunge! You look as lovely as always Maria! What a lovely dress, love the print. Been looking at getting a fitbit, I have an app on my phone that tracks certain things, but think this would be a lot more accurate.